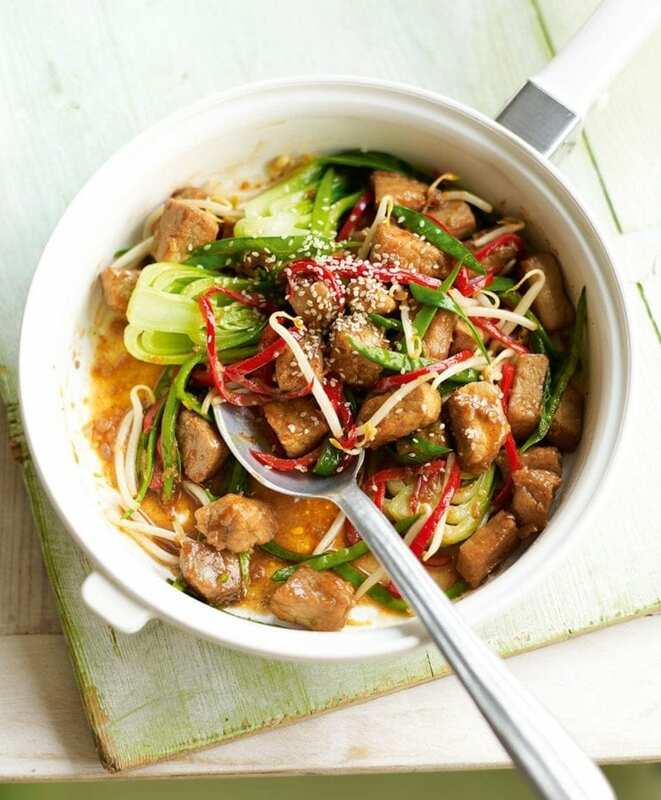 Bring all the tastes of vibrant Chinese takeaway into your home with this sticky Chinese pork recipe. Place the pork in a bowl with the soy sauce, sesame oil, five spice, garlic, ginger and honey. Toss together and set aside for 10 minutes. Heat half the oil in a frying pan over a medium heat. Add the pork with a slotted spoon and fry until almost cooked. Add the marinade and bubble for 5 minutes until sticky. Meanwhile, in a separate wok or frying pan, heat the remaining oil and stir-fry the pepper and mangetout with a splash of water for a few minutes. Add the pak choi and cook for a further minute, then stir in the beansprouts. Toss with the pork, drizzle with soy sauce, sprinkle with the sesame seeds and serve.